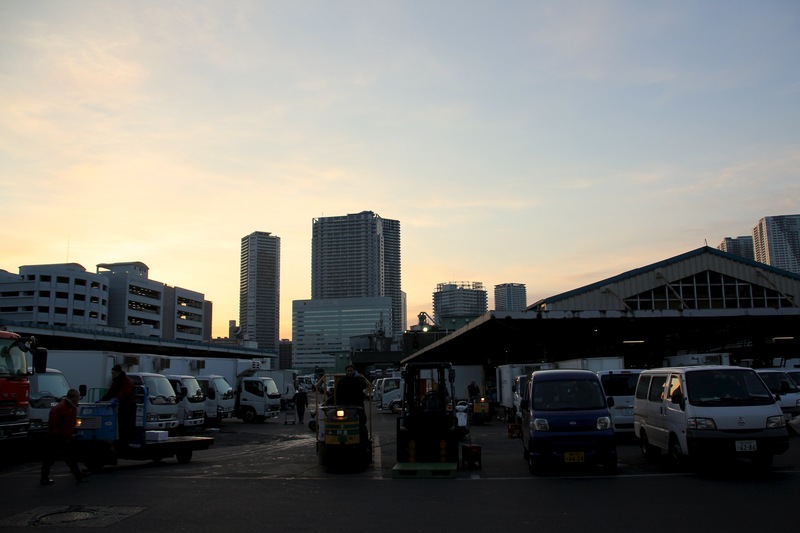 Despite being a city that boasts an intersection where 100,000 people cross each hour and a train station that hosts 3 million travellers each day, the streets of Tokyo are empty on our 4:30am drive to the Tsukiji Market. 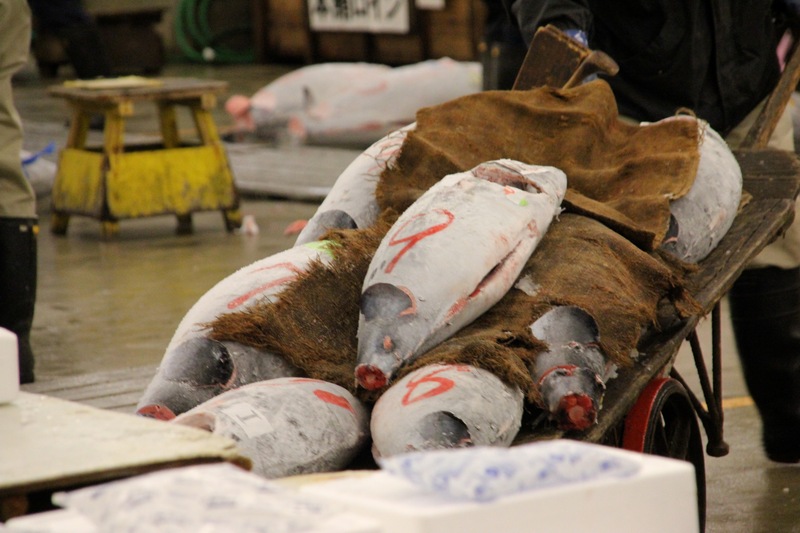 Inside the market, however, the action started hours ago, as wholesalers, known as oroshi gyōsha, arrive at 3am to set up the tuna displays for the auction at 5:30a.m. 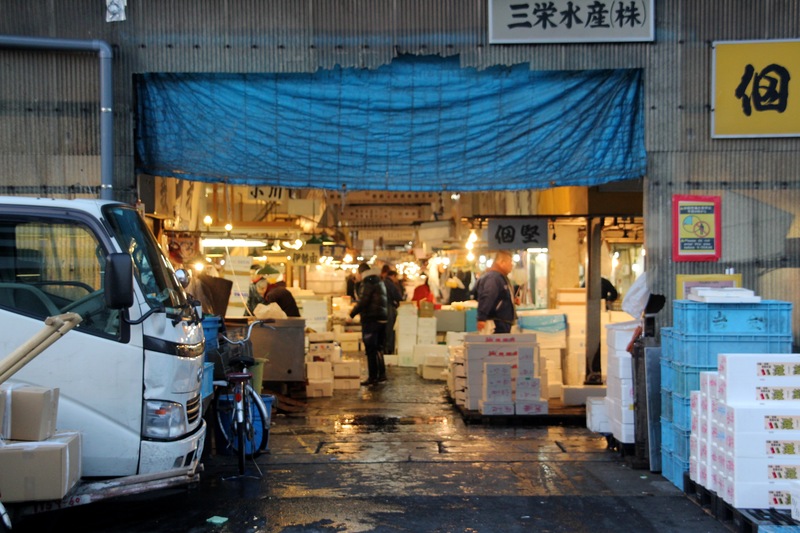 With over $5.5 billion U.S. in annual sales, the Tsukiji Market is the busiest fish market in the world. 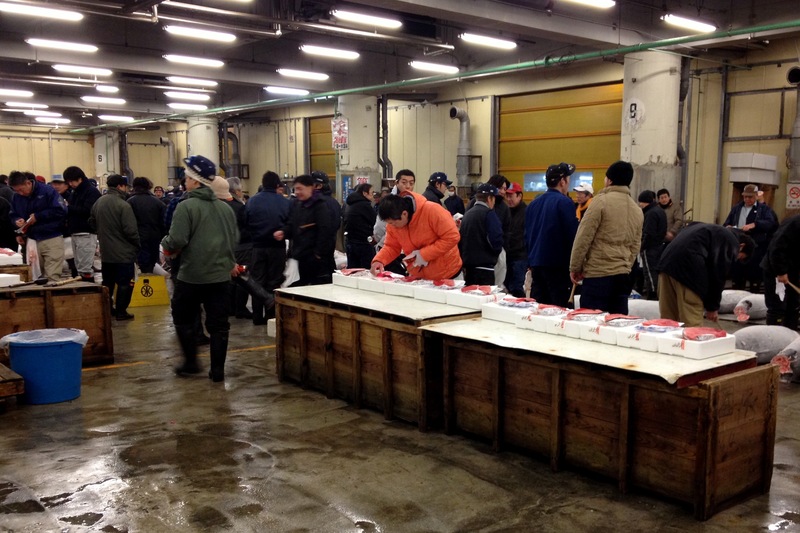 Only 120 tourists are allowed in each morning, in two batches of 60 people, to observe the tuna auction. Donning our blue safety vests that serve to both identify which group we’re in and to make us more visible, we file into a small strip of space set aside for watching the auction. 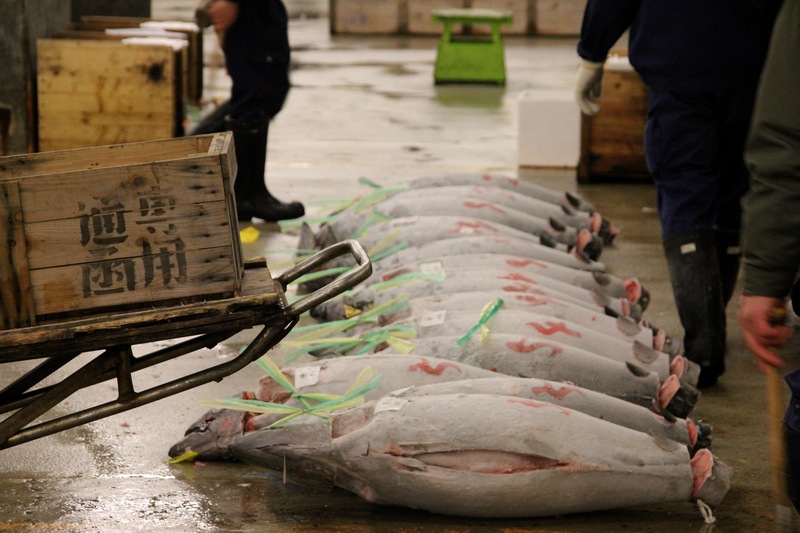 Frozen whole tuna, each more than 3ft in length, line the floor row upon row. Overturned crates serve as tables to display samples. 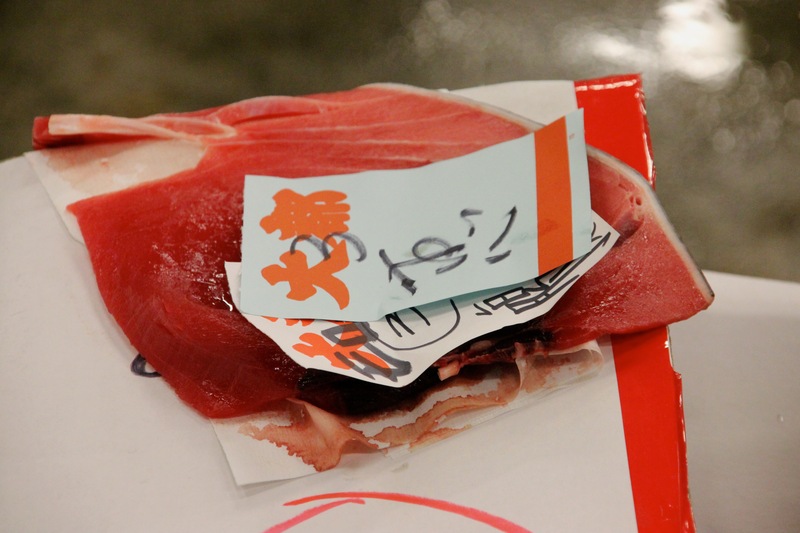 Potential buyers inspect the bright red tuna slices carefully, poking and prodding, occasionally sniffing, even getting out their flashlights to closely examine the flesh. The auctioneer’s ringing bell signifies the start of the action. Buyers gather around, ready to bid for their selections. The auctioneer doesn’t so much call the auction as sing it. It’s a performance to keep the buyers engaged and get the best price for the sellers. The melodic chanting fills the cavernous warehouse as buyers raise their hands and point to signify their increasing bids. 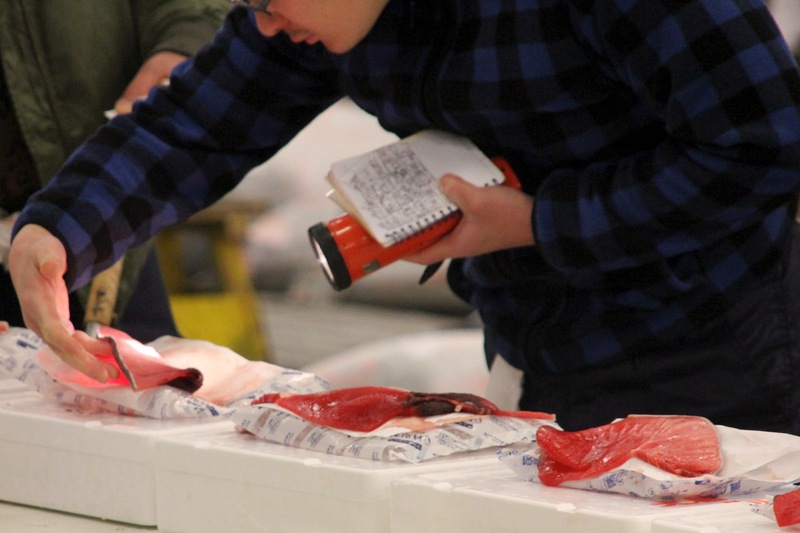 Once sold, the samples are marked and matched with the whole fish to eventually be carted off for processing or packed for shipping to their final destination. After the auction, we wander to an area full of small restaurants that serve the many employees of the market and the curious tourists. It’s breakfast time, and given the activity of the morning, sushi seems the only appropriate choice. We pass by the famous Daiwa Sushi with its lineup and 45-minute wait, choosing instead to try a lesser-known small spot a few rows over. Seated at the counter, we watch our breakfast being made and then enjoy the fresh, soft rice and fish. No soy sauce this time…we want to taste all the nuances. The Kansai-style unagi is so good that we order seconds. Bellies full of oishii fish and minds full of vibrant images from the morning, it’s 7:30am and about time we head home for a nap.